Ah, summer. A time when the sun shines brightly, birds chirp their joyous melodies and the long, hot days melt away, easing into tranquil, balmy evenings. For many, summertime washes away our worries, like the sea draws out the tide. For others, it’s a time of heightened pressure and urgency, with many of us scrambling to buy last minute gifts, throw perfect parties and fulfil countless social obligations. This festive season, make time for yourself by stepping back and indulging in a creative outlet. Be inspired to pick up your camera and embark on an adventure, or try your hand at poetry as a means of imaginative escape. Speaking of escapes, we encourage you to conquer your fears by holidaying alone. 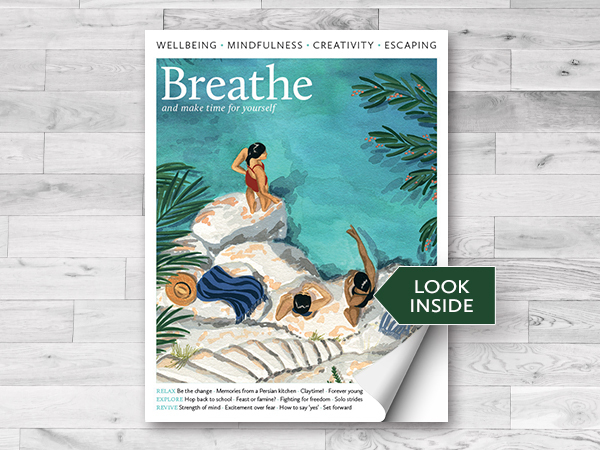 If that’s a stretch, make small steps and try new experiences on your own to boost confidence and wellbeing, with tips in this issue of Breathe. However you decide to give back to yourself, we hope it’s inspired in part by this issue, which is dedicated to you, our strong, smart and incredible readers. Have a beautiful summer!